Where can I buy a pet tarantula? Pet tarantulas are popular and therefor are easily attainable. You can find them at pet stores, reptile shows, and through online and mail-order breeders and dealers. Lots of people have pets and pet stores are everywhere. Most pet stores will have at least one type of tarantula for sale. If they do not have any tarantulas for sale, they can often special order you one. Reptile shows have more than lizards and snakes. They usually have various types of insects and spiders for sale. You can find a nice selection of animals from which to choose your pet tarantula. As an added bonus, the prices at the shows are very reasonable. There are reptile shows several times per year near most major cities. 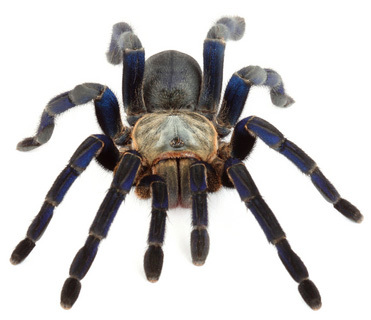 Online and mail-order breeders and dealers are a great way to get a hard to find tarantula. They are also useful if local pet stores don’t carry tarantulas and you can’t find a pet show locally. If you can’t find the spider you want online, it isn’t available. What kind of tarantula should I get? You will want a pet tarantula that is not aggressive and can be handled if needed. The spider should also be hardy and require little care. If at all possible, you should get a tarantula that has been captive bred instead of caught in the wild. On the menu there is a list of the more common tarantulas for sale and their individual needs and requirements.